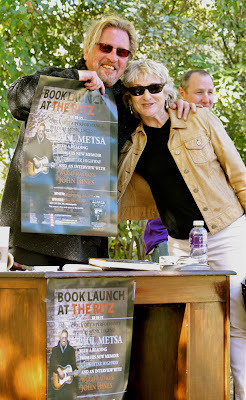 Yesterday afternoon, at a "private-public" event in a tree-filled backyard in Edina, Minnesota, the musician, songwriter, and raconteur Paul Metsa signed copies of his new book, Blue Guitar Highway, and sang a few songs--solo and with his friend Willie West, who had driven down from St. Cloud for the occasion. Willie's wife stayed home and worked his shift so he could attend the event. Other people came from faraway places including Paul's friend Joe, whose last name I forgot but will have to ask Paul about because he, too, is writing a book about music, forthcoming from SUNY Press. Photographer Darin Back was there, and Paul's lovely girlfriend, Amy, who has a farm where Paul finished writing his book and where his dog, Blackie, now prefers to stay, returning only reluctantly to Paul's apartment in Northeast Minneapolis. Music promoter Sue McLean stopped by, and Paul thanked her for giving him his first gig at the Guthrie—the old Guthrie, which he had futilely tried to save from demolition in the mid-2000s. (He writes about that in his book, in a chapter called "Slings and Arrows.") We had scandalous early-afternoon cocktails and talked with our friends Jon Tevlin and Ellen Hatfield. 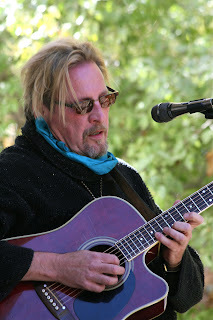 Paul read a bit from his book, a memoir of his life in music, and told us that when he was starting to write it, he warned his father, "Some parts will be painful for you to read." His father replied, "Tell the truth, son," thereby setting him free. Later, he plugged in his guitar on the patio and sang "Virginia" and "Jack Ruby" and "Slow Justice," then invited his friend Willie to join him. While Paul played guitar, Willie sang Bob Dylan's "All Along the Watchtower," his voice rising into falsetto quavers (oo-oo-oo-ooh) and making the hair stand up on the back of my neck. The hour is getting late. Blue Guitar Highway by Paul Metsa, foreword by David Carr of the New York Times, has just been published by the University of Minnesota Press. 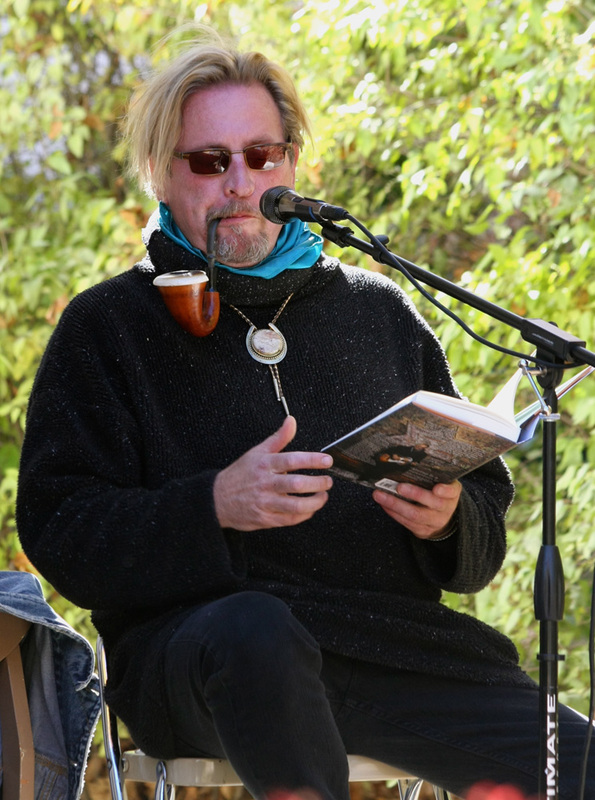 Here's a schedule of upcoming readings and performances. The official launch party takes place on Wednesday, Oct. 19, at the Ritz Theater in Northeast Minneapolis at 7 p.m. Very nice!!! I was the large blonde man taking pictures... was sitting with Willie West! Congratulations to Paul Metsa, who also just became an official tester for Tito's Handmade Vodka. I asked Paul about the vodka thing and he set me straight, but I've posted this comment anyway because it's fun. Plus Paul says "A nice gig if a guy could get it," so maybe someone will read this and offer him the job. Paulie said it best: we understood each other.